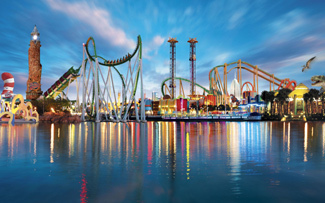 Islands of Adventure is next door to Universal Studios Florida. 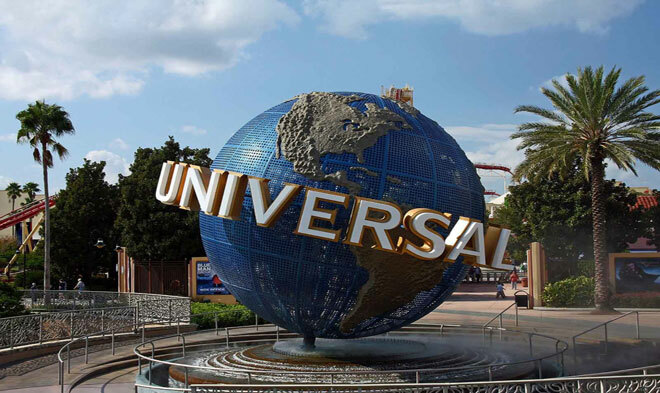 Although it's been there since 1999, with a pretty impressive catalog of thrill rides and intricately themed lands, it never really came into its own until the Wizarding World of Harry Potter opened in 2010. The lands are actually known as “islands,” in keeping with the theme park's name. The first area is the Port of Entry, which is just what its name implies. You step inside the gates and immediately feel like you're embarking on a new adventure. This area has a large gift shop that's very convenient to hit on your way out of the park, as well as smaller shops like a candy store and a shop with a Christmas theme. There are also fast service food outlets and the full-service Confisco Grille restaurant. The other islands have food outlets and stores as well. Marvel Super Hero Island is an area aimed squarely at those who want a thrill, just as you'd expect for a place themed to characters like Spiderman and the Incredible Hulk. Both of those heroes have their own rides here. The Amazing Adventures of Spiderman is a 3D dark ride adventure with some very realistic special effects that might even convince you you're falling from the top of a building. The Incredible Hulk roller coaster shoots you up the lift hill and immediately into a loop before you speed along the rest of the track. 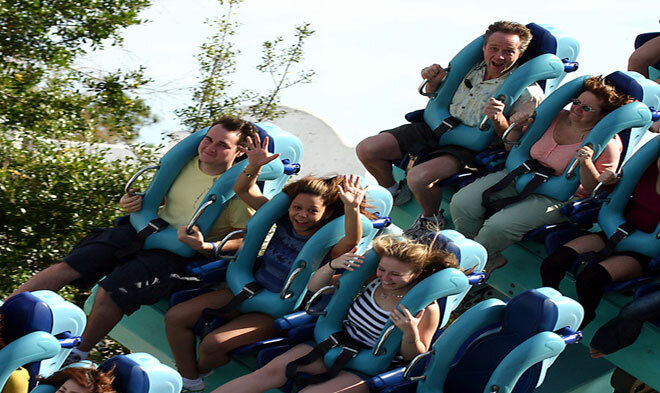 The third big thrill in this area is Dr. Doom's Fearfall, which shoots you 150 feet in the air for a breathtaking, if quick, view of Orlando. Watch for Marvel friends and foes to come out for photo opportunities. Toon Lagoon has some thrills, although it's also got fun for younger kids. The two rides, Dudley Do-Right's Ripsaw Falls and Popeye and Bluto's Bilge-Rat Barges, are both very soggy experiences that should be left for warmer days. The Dudley Do-Right themed ride is a log flume and is usually drier than the Popeye raft ride, which leaves most riders soaked to the skin. Small kids love playing in Me Ship, the Olive, a cute interactive nautical playground. The younger members of your family might scratch their heads at characters from old comic strips like Gasoline Alley, Beetle Bailey, and Blondie, but the adults will give a knowing smile. 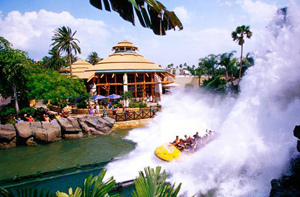 Jurassic Park is another spot with a water ride, the Jurassic Park River Adventure. It starts out as a pleasant journey to see the dinosaurs and ends up in chaos, much like the movie, with a big drop at the end. There's also a kid-friendly ride that doesn't even allow adults unless they're accompanied by an child. 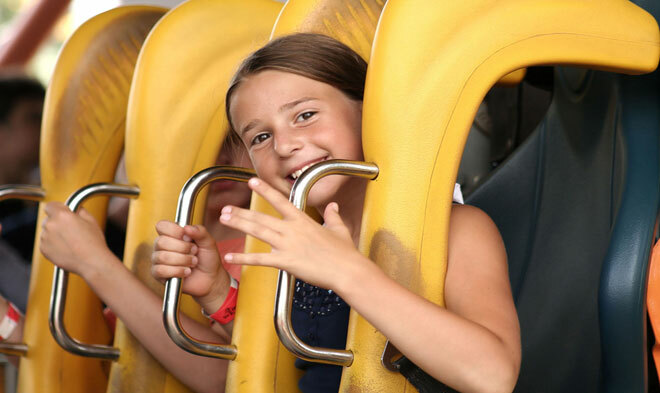 The ride, Pteranodon Flyers, zips the youngsters through the air in two seater “hang gliders.” There's also the a hands-on discovery center and the Camp Jurassic play area. If you visit during the busy season, the kids might even get to close to a “live” triceratops as it gets a veterinary exam. Seuss Landing is based on the popular kids' books with immortal characters like the Cat in the Hat and Things One and Two. Everything here is geared to younger family members, although nostalgic adults enjoy this area, too. There's a Cat in the Hat dark ride, the High in the Sky Seuss Trolley Train, and the spinning One Fish Two Fish Red Fish Blue Fish that continues the Islands of Adventure trend of rides on which you can get wet. A particular favorite is the Caro-Seuss-el, filled with whimsical creatures inspired by the Dr. Seuss books. Energetic kids can run rampant in the If I Ran the Circus play zone. 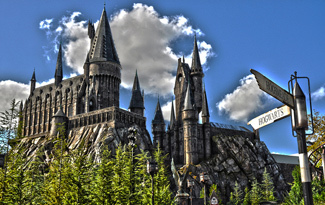 The Lost Continent used to be a full island, but it was whittled down to make room for the Wizarding World of Harry Potter. 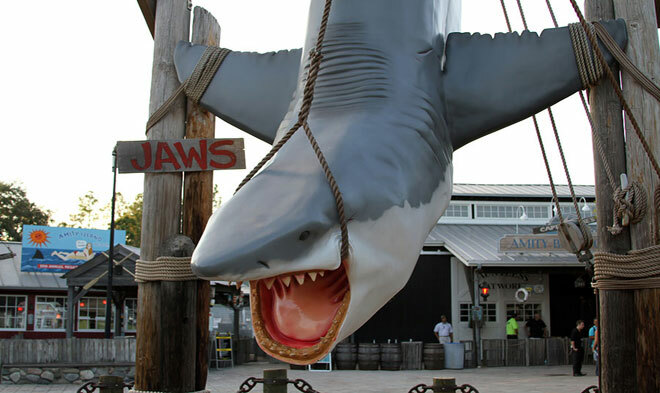 Now, it's mainly known as the home of Mythos, a sit-down restaurant, and it still has two attractions, both of which are shows. The Eighth Voyage of Sinbad is a stunt show, while Poseidon’s Fury is based on an impressive, watery special effect. All of those islands are impressive, but the big draw is the Wizarding World of Harry Potter, where you literally step into Hogsmeade and visit familiar stores like Zonko's Joke Shop and Dervish and Banges, as well as taking a tour of the legendary Hogwarts Castle. You can simply walk through and enjoy it or, if you have the nerve (and stomach) hop aboard Harry Potter and the Forbidden Journey for a wild ride through the (simulated) sky as you dodge everything from dragons to dementors. This area has a pair of intertwined roller coasters, Dragon Challenge, and a smaller family coaster, Flight of the Hippogriff, for the kids. It also has Ollivander's Wand Shop, and the lines for that store get very long since guests are taken inside in small groups. Only one guest per group actually has the experience of being chosen by a wand, but everyone can buy wands after the show when they exit into the Owl Post. 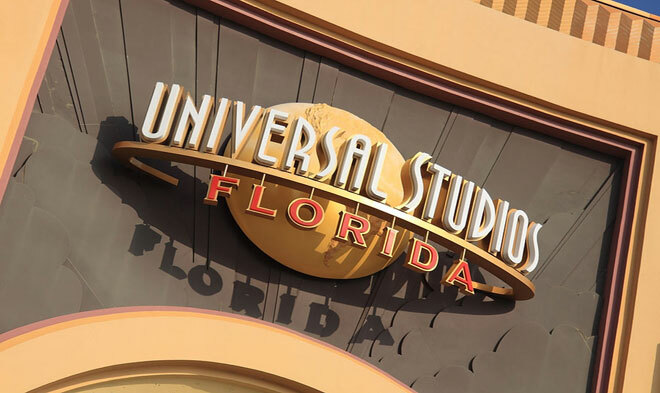 If the kids are clamoring to see the Wizarding World of Harry Potter, or if they love thrill rides, visit www.orlandtravelproviders.com or call 1-800-618-5002 to arrange your trip to Universal Orlando Resort.